So many people are writing what they are thankful for every single day this month. I think that is admirable. I have many, many, many (did I mention many?) things that I am thankful for every single day, but I know I wouldn't have the tenacity to stick to the gratitude posts every single day. Just look at me, I'm already 13 days late into the whole concept. 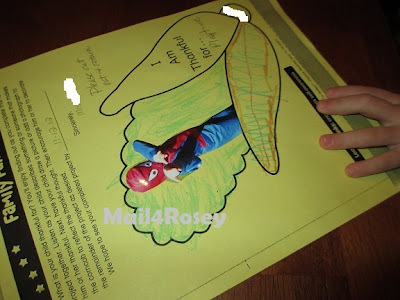 My youngest child's school, however, is also stressing the importance of being thankful this month, and they sent home an activity for us to take three days to complete. They wanted us to be very thorough in helping our children go through the things they're thankful for, and they said the answers would surprise us in the end. I think they were going for sappy (I'm not against sappy). My son, in all of his 5-year-old glory, went through his list of things he's thankful for, for three days running. We discussed it in the car, in the house, before he went to sleep at night, etc. We weren't overdoing it, just trying to get the most out of the exercise. After all of the options were discussed and exhausted I told my son to pick the one or two things he was the most thankful for, and he decided that the one thing he was most thankful for was 'playtime.' He selected a picture of himself in a Spiderman costume and we glued it on there...that was that, and I didn't think about it again. Last night we went to a parent/teacher conference at his school and his teacher had cut out all of the pictures and put them on the wall just outside of the classroom. 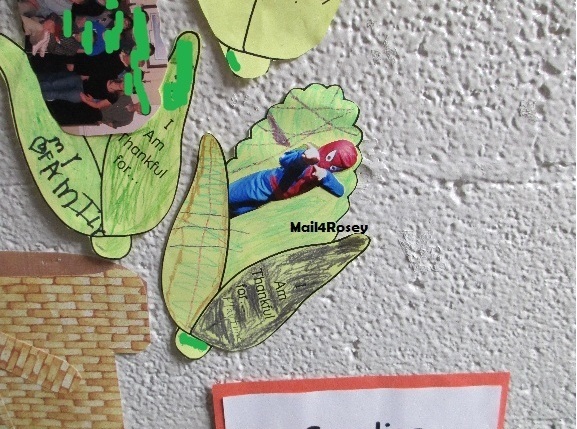 Among all of the pictures of happy families, babies, and the like was my son's Spiderman submission, TOTALLY sticking out like a sore thumb. Everyone but my child had elected for sappy, lolol. Beautiful, very sweet! Something my boys would say! Love to see what he is thankful for. REally sweet boy. LOL - he was just keepin' it real. On another note, I have a gratitude journal and I don't know where it is. While sappy is nice, playtime is just as important as work. Glad your son has that perspective. It will serve him well when he's an adult. Great job, mom! I agree with TheMomsGroup. I bet some of the other parents were embarassed by what their children really wanted to put down, and steered them towards what they thought would sound good on paper. Glad you let your son be free to express what he is really thankful for. I think it's great that you let him pick what he wanted to pick. Very likely the other kids were encouraged to pick what their parents thought was the "right" answer. I think his is great! Hey - he's his own man and he clearly knows what he wants. I bet everyone else got a chuckle out of it when they saw it hanging on the wall. Plus, how cool is he in his Spiderman costume? Seriously. Lovely! Just lovely. Always enjoy reading what others are thankful for! I can't stick with the dailies either. I can stick them in as I remember them sometimes. But I love this venture of asking adults and children to look at what you have to be thankful for. Just the mere fact that I wake up is a thanks. There is something about children's purity that shines through in their daily interactions and I just love it! I don't want them to lose it. But they usually do. You are a good mama Rosey! Wonderful post! It is always great to give thanks! Awww that's cute--I bet they WERE surprised, lol! I agree--teaching kids thankfulness is so very important for their happiness! dіd not haρpened in advance! I bookmarked it.